In this remarkable novella, Hal Duncan has conjured a tale of The-Borribles-meet-Nazi-spies-and-run-headlong-into-the-occult. 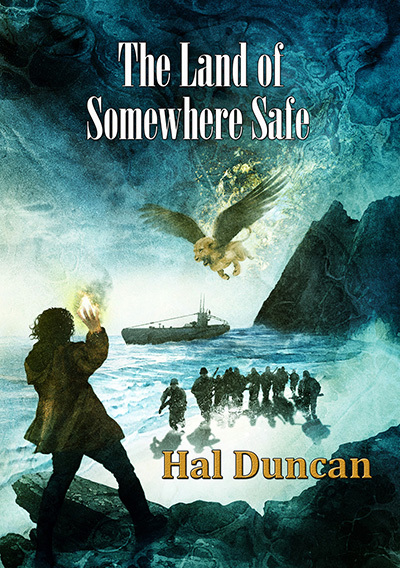 The Land of Somewhere Safe: where things go when you think, “I must put this somewhere safe,” and then can never find them again. The Scruffians: irreverent foul-mouthed street urchins, older than their years, waifs who have been Fixed by the Stamp, frozen so that they are immortal, providing perpetual slave labour. But now the waifs have nicked the Stamp and burned down the Institute that housed it, preventing any more of their number being Fixed and exploited. Peter and Lilly: two school kids orphaned by Nazi bombs, who find themselves thrown together by circumstance and evacuated from London during the Blitz. Sent far further north than intended, all the way to the Isle of Skye, they are taken in by Clan Chief Lady Morag MacGuffin of Dunstravaigin Castle. With them are the four Bastable children – a jolly queer bunch – who prove to be far more than they seem. Available as paperback, signed limited hardback and kindle editions.